Suicide Swans are alt-country/rock’s answer to psych rock heros King Gizzard and the Lizard Wizard. 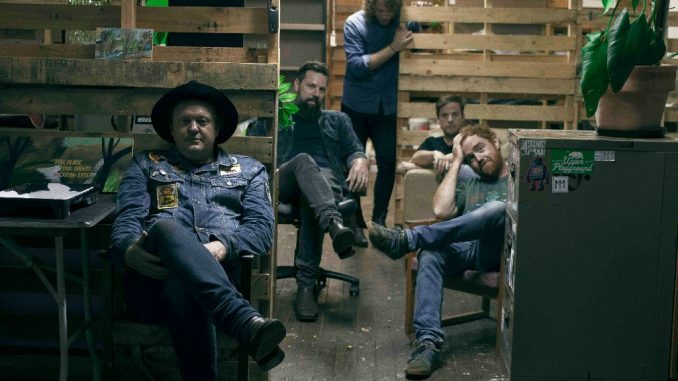 After the release of their critically acclaimed album Augusta in October 2017, now with La Jungla out April 13 and another record set for release later this year, the band are currently averaging one full-length release every six months. The five piece write and record in their home studio in Toowoomba, they release everything independently on their own label Near Enough Records and their live show is a raucous, energetic spectacle. You can catch said spectacle at Leftys Old Time Music Hall tomorrow night for their album paunch party in Brisbane. But before then and ahead of it’s release you can listen to La Jungla in full and have Kyle Jenkins (vocals/guitar) talk you through each track. This song is more like righting prose where the music almost becomes like a soundtrack to the imagery and settings of the words. I usually like to write where I mix first and third person aspects together with both direct descriptions and using words more abstractly like painting. This is one of those songs where I am describing a setting but from the perspective of all individuals involved, so you a getting multiple sides of the story fragmented together. What is the story, well you tell me. Well this is like a dirty back ally city life gone awry type themed song. It is a collapsing of two events together where the actions of the first event leads to the second occurring. The victim becomes the perpetrator through the act of revenge. It is about a real person who has passed now sadly, but led a very colourful nightlife and lived next door to me in Sydney. We would have a drink every afternoon before they’d go off and do their thing and I’d do mine and then the next day we’d share wounds and war stories from the night before and then begin it all again. It is a song about feeling trapped and entrapped. The feeling of being trapped by the things you wish to entrap. The song fluctuates through this dichotomy of disappointment, loss, hope and joy and moves in an out of these topics throughout the song. The idea of drifting or floating permeates throughout the song as a metaphor for letting go and allowing chance and coincidence to direct you like a ship without a rudder or sail. Sometimes it is good to just let go, allowing the stars to align or fall from the sky and see what happens. This one is/isn’t about someone I know. What I mean by that is that it’s both me speaking to another person but at the same time having a dig at myself in a kind of really egoistical self-depreciating way as if to say ‘get over yourself and get on with it’. It is about questioning – do the things you believe, the personal ethics/methodologies/beliefs/feelings that you base yourself on (your personal foundation) really mean anything in the end. I am not sure if they save anyone or protect him or her. Therefore, I will leave it up to someone else to tell me differently. The songs basically about yearning and trying to convince someone to take a chance, pointing out all the great features of that place, space and time the narrator is in/wants them to move to with them, but feeling like they are getting nowhere in convincing this other person to take the leap with them. When in fact all they really should do is be honest and fess up to their true intentions that is they want that person in their life and they want that life to be built together somewhere new. The song came around thinking about the idea of getting older and starting to both understand what you believe in but also question everything in your life from partners, friends, acquaintances but also turning that back on the narrator where they are now questioning themselves and their value as a person. In many ways, the title is self-explanatory of just stating ‘We Don’t Know Who We Are’ because nothing is made-up of one thing but many fragmented things and all those jumbled and glued together thoughts, feelings, heart brakes, joy, happiness and helplessness is all contained within us. I wanted to write a song that had two parts to the story, a Side A / Side B vinyl feel. So first part: ‘Here On Out’ is all about being completely committed to someone and that it is just the two of you taking on the world while building your own new world at the same time in a complete bubble of blissful ignorance. The second part: ‘Turn Off The Lights’ is all about that world you’ve built coming to an end and trying to face it but denying it somewhat at the same time. Everything ends and that is the sad fact of reality. For this song trying to convey a sense of emotional floating of being swept away like a running river or sinking to the bottom of the ocean and being suspended in that moment of not being connected to anything in particular. Then at the end of the song waking and realizing you are now in a place you don’t recognize and you start to see your home from an outsider’s perspective seeing the qualities and virtues in what you have and celebrating that rather than not seeing the small incidental aspects of your life that are magic. It came together quickly after the birth of my first child. She wasn’t sleeping and I was awake late at night in those early cold hours of each new day and I just started to think about and consider the weight of being responsible for this new person and being married and having a mortgage and god knows what else and all these self-doubts fell into this song. The narrative of the song is just fluctuating between hope and nervousness of not messing this situation, relationship, person/baby up. This song was about a book I read titled ‘The Mountains of California’ by John Muir. I read it when I was staying in New York in the East Village on Avenue A between 12th and 13th in an apartment. The book chronicles Muir’s environmental preservation adventures in the Sierra Nevada’s of California. I was reading this book regarding the power of nature and feeling small but protective of such places because they are fragile in their expansiveness and the dichotomy between the book and New York City where I was situated. Outside was the giant city where skyscrapers like man made sequoia trees and in this book, I found this amazing description of landscapes and sequoia trees where the words in the book were like painted colours on a page. Each page slowly built the composition and were so vivid and the main character in the story being this figure that is both separated from the hills but also needs to be a part of it, to protect it, but then realizes they are somewhat failed in their utopian wants. As if living and in turn being swallowed up by a large city where you, become a spec on every street significant and insignificant at the same time. I wanted to write a country based song that was all about a first person narrative through an almost spoken word delivery. It is really just a song about leaving your house and walking without any particular reason or direction but in the moment of idleness your thoughts become like flashback cards where each card embodies a scene in your life you have experienced and you are now revisiting it again. Remembering, remembrance, fading imagery and moments, retelling autobiographical stories all contained within the narrators body. Their whole world has become a flick card book of quickly seen and then forgotten moments, retold and relieved but never experienced the same. I also wanted the album to finish with a more country song because this will be the direction that the Suicide Swans fourth album ‘Reservations’ will be taking. In many ways, the song becomes a bookend to both finish this album but to be the jumping off point for the next.